There are two ways to refer to this car. 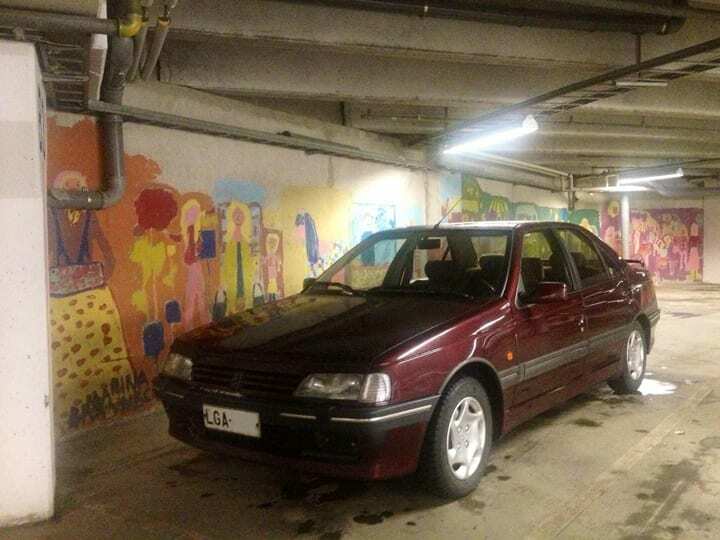 A simple, non-sugarcoated one is to say I have a French car with peeling paint and leaking coolant. The other, a more sympathetic way is to declare that I drive a 1992 Peugeot 405 Mi16 that isn’t yet as good as it could be. Both sentiments are true, but it’s the latter that drives me forward. As does the Mi16, whenever I need it to. Does it sound like a motivational Facebook poster image yet? 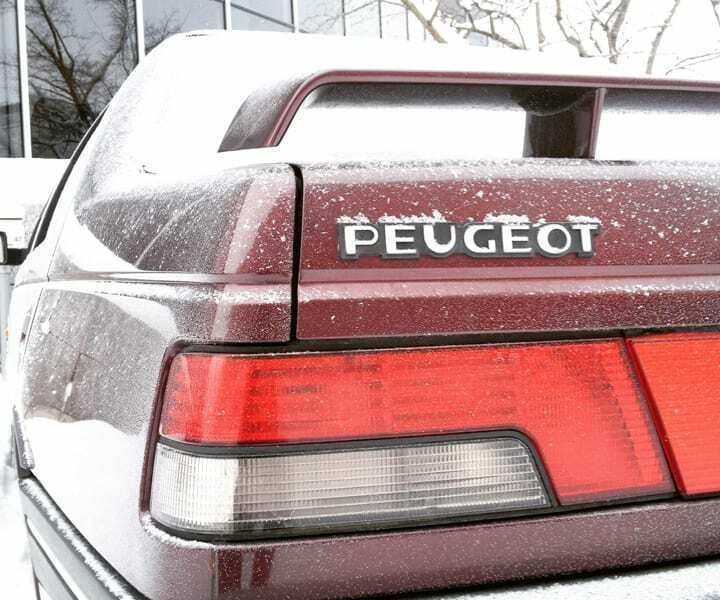 After the previous, introductory post, the Peugeot spent a couple months at the local vocational school’s auto shop. During that time, it received a new cambelt + waterpump combination, along with the strut mounts getting replaced with new OEM ones, as the old ones were just crumbling rusty discs that resembled Finnish rye bread more than anything holding a strut to anything. The shop also noticed the alternator was way past its prime, and proceeded to order one and fit it. 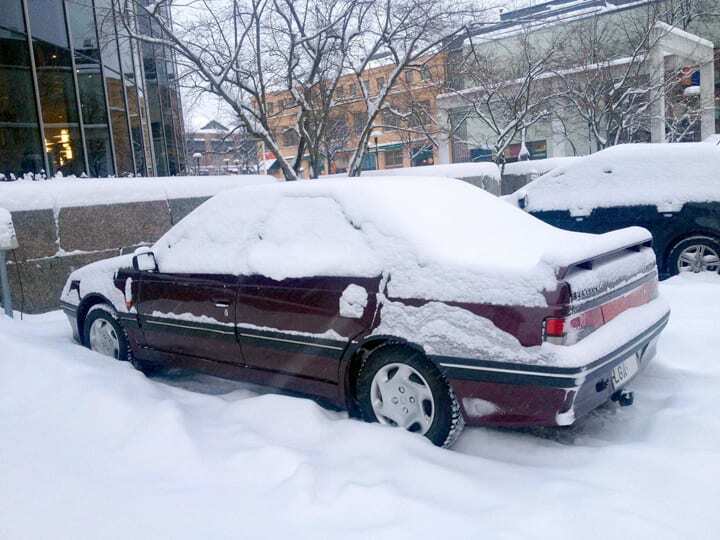 A couple weeks ago, I got the car back and felt tremendous relief to actually be able to use it. Fifteen minutes after getting the keys, I noticed the coolant warning light was on and the temperature needle hovered at 100°C. Damn. I drove the car to an another shop immediately, as I had planned to get the motor oil changed. It’s something I always get done soon after getting a car, unless it has literally had it changed the day before. The shop poured in two and half litres of coolant and bled the system properly, making the car blow hot air when asked to. At first I wondered, if there had been a snafu at the school shop, and whether they had neglected to fill up the system after the water pump work, but after doing some actual driving it’s apparent the radiator leaks quite profusely. Coolant doesn’t exactly come streaming out, but the snow on my parking lot tells a vivid green story. 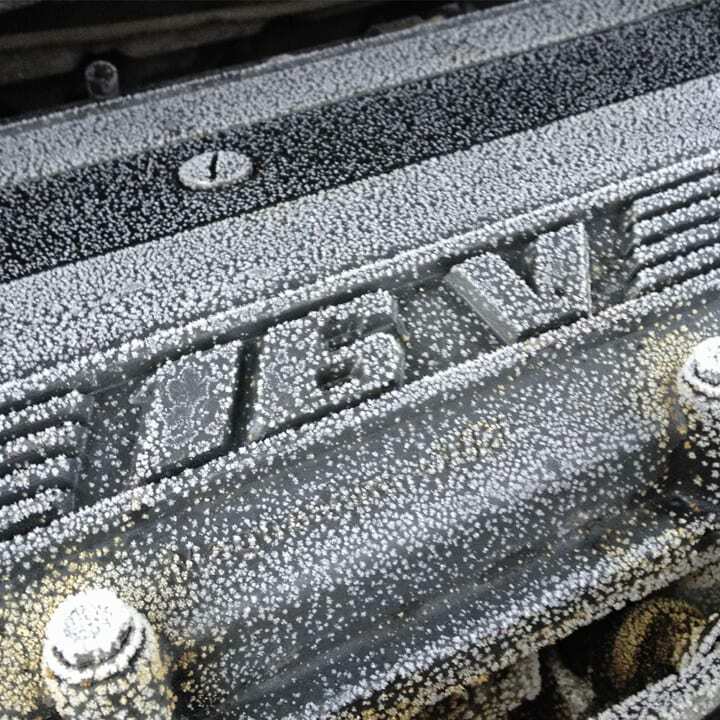 I do think they didn’t bleed it right, as the car didn’t produce hot air from the vents even when warmed up. A new radiator has been ordered, so the matter will be rectified soon enough. Until that time, I will keep my eye on the coolant level and keep pouring more in. But it’s not all a tall tale of deferred maintenance or towering repair bills. Now that the cambelt has been changed, I’ve been able to use the car like it’s intended: namely, taking it past 5000 rpm every once a while. And… the prophecy is true. It’s a tremendous engine, one that pulls like a freight train for being a naturally aspirated 150-horse 1.9-litre four. Give it a small gear and it’ll jump forward like an alarmed animal, give it a taller gear and it’ll find you speeds completely unnecessary in wintertime Finland. Especially since the tires on it are absolute garbage and the front will wash wide every time the asphalt isn’t dry. But when the moment is right, the Mi16 will show you what it was built for, and why I ended up buying one. I’ve contacted some body shops to fix the front bumper at least, and new foglights will get ordered from France after more pressing issues, like actual winter-capable tires have found their way under the car. I’m also adamant I can get correct Mi16 five-spoke wheels for winter use, so I can ditch the two sets of rubbish steelies as soon as possible. In some ways, the car feels better every time I drive it, not worse. Not all cars manage that, and I hope the development never stalls.